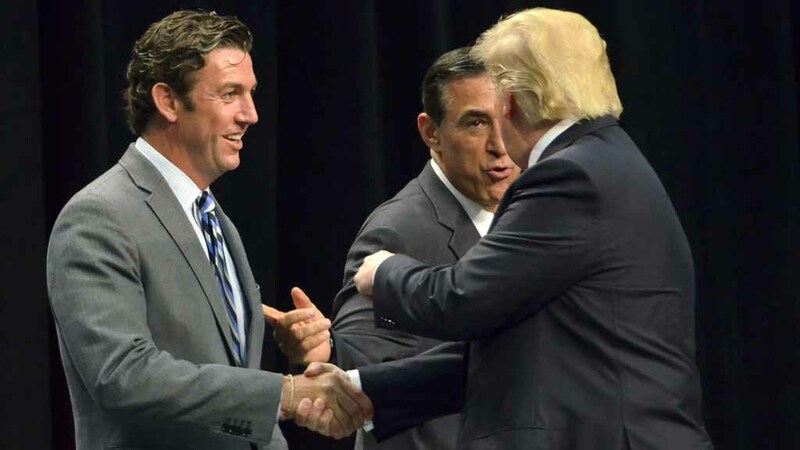 Amid worldwide condemnation of President Trump’s travel ban, supporter Rep. Duncan Hunter is making a plea for some Iraqis caught in the hasty executive action. Hunter and Illinois Rep. Adam Kinzinger, who both served in Iraq and Afghanistan, sent a letter to Trump backing Defense Secretary James Mattis’ request to exempt Iraqis who served alongside the U.S. military. “We made a promise to the men and women who served alongside us on the battlefield, and we must uphold that promise to leave no man behind,” said Hunter and Kinzinger in a joint statement. Mattis has requested an exemption for military interpreters, aides and other allies who risked their lives alongside U.S. personnel and were covered by the Iraqi Special Immigrant Visa program established in 2008. Hunter, who was among Trump’s first supporters in Congress, represents a district that includes a large community of immigrant Iraqi Christians. Trump’s Friday afternoon order indefinitely barred Syrian refugees from entering the United States, suspended all refugee admissions for 120 days and blocked citizens of seven Muslim-majority countries from entering for 90 days.